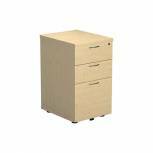 Jemini Oak 3 Drawer Under Desk Pedestal KF72088 Pack of 1 Jemini 3-Drawer Under Desk Pedestal. Lockable pedestal with two box drawers and one foolscap filing drawer. Fits neatly under desks or can be used independently. Dimensions - W434xD580xH690mm. Finish - Oak. Non returnable. 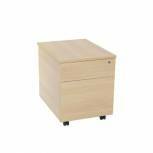 Jemini Maple 3 Drawer Under Desk Pedestal KF72089 Pack of 1 Jemini 3-Drawer Under Desk Pedestal. Lockable pedestal with two box drawers and one foolscap filing drawer. Fits neatly under desks or can be used independently. Dimensions - W434xD580xH690mm. Finish - Maple. Non returnable. Avior Cherry 600mm Desk High Pedestal KF72285 Pack of 1 Avior 3-Drawer Desk High Pedestal for the Avior executive desk range. Lockable pedestal with two box drawers and one foolscap filing drawer. Dimensions - W435xD600xH750mm. Finish - Cherry. Non returnable. Avior Ash 600mm Desk High Pedestal KF72286 Pack of 1 Avior 3-Drawer Desk High Pedestal for the Avior executive desk range. Lockable pedestal with two box drawers and one foolscap filing drawer. Dimensions - W435xD600xH750mm. Finish - Natural. Non returnable. 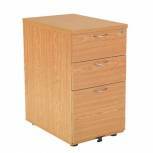 Avior Cherry 3 Drawer Mobile Pedestal KF72287 Pack of 1 Avior 3-Drawer Mobile Pedestal for use with the Avior executive desk range. Fully lockable for filing and storing. Dimensions - W435xD600xH650mm. Finish - Cherry. Non returnable. Avior Ash 3 Drawer Mobile Pedestal KF72288 Pack of 1 Avior 3-Drawer Mobile Pedestal for use with the Avior executive desk range. Fully lockable for filing and storing. Dimensions - W435xD600xH650mm. Finish - Natural. Non returnable. 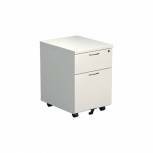 Avior Cherry 2 Drawer Mobile Pedestal KF72290 Pack of 1 Avior 2-Drawer Mobile Pedestal for use with the Avior executive desk range. Fully lockable for filing and storing. Dimensions - W435xD600xH650mm. Finish - Cherry. Non returnable. Avior Ash 2 Drawer Mobile Pedestal KF72291 Pack of 1 Avior 2-Drawer Mobile Pedestal for use with the Avior executive desk range. Fully lockable for filing and storing. Dimensions - W435xD600xH650mm. Finish - Natural. Non returnable. 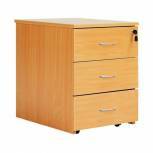 Jemini 2-Drawer Fixed Pedestal Beech KF73504 Pack of 1 Jemini 2-Drawer Fixed Pedestal Beech KF73504. Pedestal with one shallow drawer and one deep drawer. For use with the Jemini 4 leg range of desks. Non returnable. 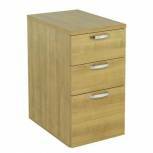 Jemini 2-Drawer Fixed Pedestal Oak KF73505 Pack of 1 Jemini 2-Drawer Fixed Pedestal Oak KF73505. Pedestal with one shallow drawer and one deep drawer. For use with the Jemini 4 leg range of desks. Non returnable. 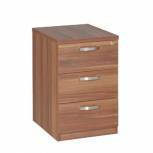 Jemini 3-Drawer Fixed Pedestal Beech KF73506 Pack of 1 Jemini 3-Drawer Fixed Pedestal Beech. Pedestal with three shallow drawers. For use with the Jemini 4 leg range of desks. Non returnable. Jemini 3-Drawer Fixed Pedestal Oak KF73507 Pack of 1 Jemini 3-Drawer Fixed Pedestal Oak. Pedestal with three shallow drawers. For use with the Jemini 4 leg range of desks. Non returnable. 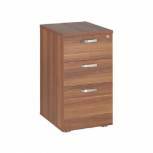 Serrion Bavarian Beech 2 Drawer Mobile Pedestal KF73516 Pack of 1 Jemini 2-Drawer Mobile Pedestal Bavarian Beech KF73516. Pedestal with one shallow drawer and one deep drawer. Fits under desk or can be used independently. Dimensions: W434 x D580 x H525mm. Non returnable. 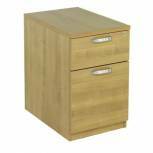 Serrion Ferrera Oak 2 Drawer Mobile Pedestal KF73517 Pack of 1 Jemini 2-Drawer Mobile Pedestal Ferrera Oak KF73517. Pedestal with one shallow drawer and one deep drawer. Fits under desk or can be used independently. Dimensions: W434 x D580 x H525mm. Non returnable. 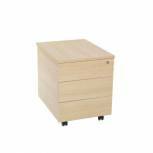 Serrion Bavarian Beech 3 Drawer Mobile Pedestal KF73518 Pack of 1 Jemini 3-Drawer Mobile Pedestal Bavarian Beech KF73518. Pedestal with three shallow drawers. Fits under desk or can be used independently. Dimensions: W434 x D580 x H525mm. Non returnable. Serrion Ferrera Oak 3 Drawer Mobile Pedestal KF73519 Pack of 1 Jemini 3-Drawer Mobile Pedestal Ferrera Oak KF73519. Pedestal with three shallow drawers. Fits under desk or can be used independently. Dimensions: W434 x D580 x H525mm. Non returnable. 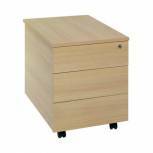 Serrion Warm Maple 2 Drawer Mobile Pedestal KF73836 Pack of 1 W434 x D580 x H525mm. Fits under your Jemini desk or can be used independently. Top lockable drawer for storage of valuable and sensitive items. 1 large and 1 regular sized drawer for storage of documents and files. High quality Warm Maple finish. 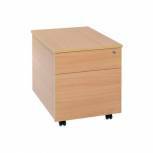 Serrion Warm Maple 3 Drawer Mobile Pedestal KF73837 Pack of 1 W434 x D580 x H525mm. Fits under your Jemini desk or can be used independently. Top lockable drawer for storage of valuable and sensitive items. 3 equal sized drawers for storage of documents, files and stationery. High quality Warm Maple finish. Jemini White 2 Drawer Mobile Pedestal KF74147 Pack of 1 Mobile pedestal with two drawers. Use under desk or independently. Includes 1x box drawer and 1x foolscap file drawer. Mounted on four castors for mobility. Height: 595mm. Finish: white. Non-returnable. 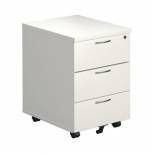 Jemini White 3 Drawer Mobile Pedestal KF74148 Pack of 1 Mobile pedestal with 3 drawers. Use under desk or independently. Includes 3x box drawers. Mounted on four castors for mobility. Height: 595mm. Colour: white . Non-returnable.